This is the Subarea plan for Executive Park. It contains objectives and policies to guide land use decisions, and background to them. Executive Park is a Subarea of the Bayview/Hunters Point neighborhood in southeastern San Francisco. The Executive Park Subarea comprises the southernmost 71 acres of Bayview. It is bounded on the west by US Highway 101, on the east by the Candlestick Point Special Use District, on the north by Bayview Hill, and on the south by Candlestick State Park and San Francisco Bay. Executive Park faces south towards San Francisco Bay. While the area itself lies within Bayview Hunters Point, Executive Park is closely connected to Visitacion Valley and the Little Hollywood neighborhoods west of Highway 101. Being on the south side of Bayview Hill separates it physically from Bayview Hunters Point. Candlestick Point, and the 49ers Stadium and parking lot is to the immediate east. Executive Park's focus on the Bay and its street network both orient the area to the neighborhoods to the west and to the south. Executive Park is now an office park with some housing on the far eastern end. The office buildings are surrounded by surface parking and some of the housing is internally focused and gated. The area as it exists does not provide a physical framework for supporting a vital San Francisco neighborhood. The Executive Park Subarea Plan challenges this pattern. It envisions a new San Francisco neighborhood: a mixed-used residential neighborhood with attractive public streets and open space connectivity. This pervasive public quality would be achieved through a street and open space system that knits all the various neighborhood parts together and in turn links the neighborhood to its surroundings. The plan focuses on providing a welcoming environment for visitors and residents to the area through the creation of good streets, good urban design, and sound land use policies. The Executive Park Sub-area Plan sets forth objectives and policies to aide the area's transition to a residential neighborhood. It is based on the following goals. Create a new residential neighborhood to help address the city's and the region's housing needs, support regional transit use, and strengthen community facilities and services, including neighborhood-serving retail. Create a livable urban community with easy access to the waterfront and well-designed streets and open spaces. Create a pedestrian-oriented urban environment that encourages walking. Enhance public linkages within the area and to nearby neighborhood commercial districts. Encourage residents, workers, and visitors to use alternative modes of transportation. Provide a home for some 8,000 residents in as approximately 2,800 dwelling units. In recent years there has been a shift in land use in Executive Park from office to housing. 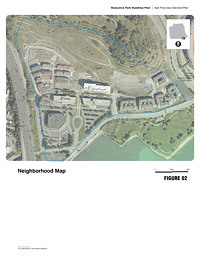 This plan capitalizes on this interest in residential development, taking advantage of the area's proximity to open space and transit to create a mixed-use residential neighborhood that balances housing density and livability, provides the services needed to support the residential population, and supports and encourages the neighborhood-serving uses in adjacent neighborhoods. CREATE A SENSITIVELY PLANNED AND DESIGNED URBAN RESIDENTIAL NEIGHBORHOOD IN EXECUTIVE PARK, INCLUDING THE REDEVELOPMENT OVER TIME OF THE OFFICE USES NOW THERE. Create an urban neighborhood that balances density with livability. Development within Executive Park must be dense enough to create a lively residential neighborhood of active, gracious streets and sufficient public amenities, with outstanding livability and quality of life. Create a neighborhood form that supports residential density. The intent of the plan is to encourage high residential densities but in a way that assures high quality livability and excellent urban design. 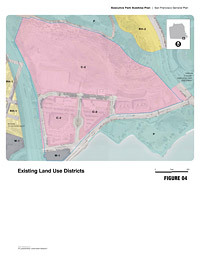 For the portions of the Executive Park Plan area that have not yet been entitled, the targeted density level would be one dwelling unit for every 400 square feet of lot area, the density level of existing RM-3 (Residential, Mixed, Medium Density) Districts and RC-3 (Residential-Commercial Combined, Medium Density) Districts, the same zoning districts that include portions of the Marina, Nob Hill, North Beach, among others. 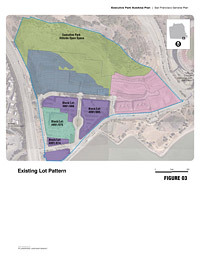 Densities would be based on existing lot configuration, but would be applied to resultant lot configuration even after portions of the lots are dedicated to creating a new internal street grid and possibly to reconfigurations of Harney Way and Alana Way. The intent is also to allow densities to be spread unevenly over the site, similar to many San Francisco neighborhoods. While some portions of the yet-to-be-entitled blocks will be at lower densities and heights, others will feature residential towers. Create a neighborhood supportive of diverse families and mixed incomes. A diverse neighborhood provides a number of benefits ranging from increased social interaction, reduction of crime, and long-term benefits to children. This new residential neighborhood should benefit from the benefits of diversity and in doing so, increase livability in the area. Executive Park development should be consistent with dwelling unit bedroom requirements elsewhere in the City and strive to provide even greater number of units suitable to families where possible. MEET THE DAILY NEEDS OF RESIDENTS WITHIN THE NEIGHBORHOOD. Encourage the development of centralized neighborhood-serving retail uses to serve the daily needs of residents. Create a town center within an easy walk for all residents to allow them to shop via foot or bicycle for daily needs, while depending on larger commercial districts like Leland Avenue in Visitacion Valley and anticipated retail at Candlestick Point for less frequent shopping needs. Small-scale retail uses should be scattered throughout the area as it grows. The retail services provided within Executive Park should not unduly compete with existing neighborhood commercial districts outside the Sub-area Subarea. The main core of retail should be at the Town Center at Thomas Mellon and Executive Park Boulevard, but allowing retail throughout. Improve physical connections that would encourage residents to shop in nearby neighborhood commercial districts, such as Leland Avenue. As part of any development, a comprehensive plan for streetscape improvements should be created to clearly lay out street design for Thomas Mellon, Executive Park, Executive Park East, Executive Park West, and the new proposed streets within them. Such a plan should strive to improve the pedestrian and bicycle connection to Leland Avenue (the neighborhood commercial district for Visitacion Valley) in order to minimize the geographic barriers that currently exist. Similarly, the Visitacion Valley Community Facilities and Infrastructure Fee and Fund, identify streetscape improvements that could include the Blanken Avenue Tunnel as a possible use of funds collected through the program. 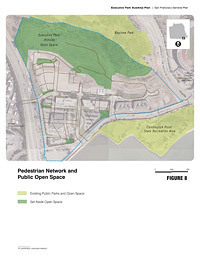 Executive Park developers, residents and other interested parties should work with residents to the west in advocating for, and planning a seemless connection from Executive Park, through the Blanken tunnel to the Little Hollywood and Visitacion Valley neighborhoods. 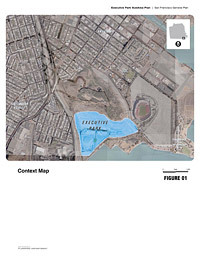 Such seemless connection would not only connect existing and future residents of Executive Park to existing neighborhoods westward, but would enable easier access Visitacion Valley and Little Hollywood to Candlestick Point State Recreation Area and new development eastward. CREATE A CITY STREET PATTERN SUPPORTIVE OF AN URBAN RESIDENTIAL NEIGHBORHOOD. Establish a new internal street grid between Harney Way, Alana Way, Executive Park Boulevard, Executive Park West and Executive Park East that would divide the existing site into smaller blocks more in keeping with the typical San Francisco built pattern. The end goal is to ensure the development of a residential street pattern that reflects the fine grain of adjacent neighborhoods, organizes neighborhood activities, is walkable, landscaped, and adequately furnished, lit at night, and equally designed for all modes of travel. The proposed street network is provided in Figure 6. Focus on landscaping, sidewalk widenings, street lighting, and street furniture to coordinate the development and character of individual development sites. Ensure existing street and new proposed streets are deigned and constructed in a way that promotes pedestrian and bicycle usage, clarifies travel ways and purpose of different streets, and is aesthetically coherent and pleasant. Based on the proposed street network provided in Figure 6, a more detailed comprehensive streetscape plan is to be developed to not only finalize standards for street cross sections, but to find a palate of streetscape improvements and plantings that can coherently be installed across Executive Park. Reconfigure the intersection of Harney Way, Mellon Drive and Alana Way to support the Subarea's new role as a residential neighborhood. Improvements to the intersection of Harney Way, Alana Way and Thomas Mellon Drive have been required of the entitled Projects of the residential development north of Executive Park Boulevard. On top of needing to better handle new traffic volumes by the entitled projects, the intersection of Harney Way, Mellon Drive, and Alana Way is currently not conducive to a residential neighborhood. It is clear that the intersection needs to be reconfigured and simplified to better accommodate pedestrians and better connect the Executive Park neighborhood (along with Little Hollywood and Visitacion Valley) to the Bay shore across Harney. 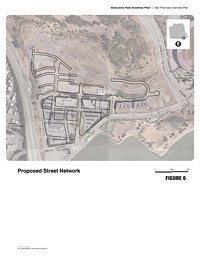 However, it is anticipated that Harney will be widened and reconfigured to handle heavier traffic volumes and to provide dedicated transit lanes to accommodate additional development at Candlestick Point and Hunters Point Shipyard. Also anticipated is a new Harney / Highway 101 Interchange. Studies are ongoing as to the best solution for Harney and the interchange and what their spatial needs will be. One possible solution that had been contemplated would separate the Alana Way and Thomas Mellon interfaces with Harney as two separate intersections, with each Alana and Thomas Mellon turning to meet Harney at 90-degree angles. At this time, this proposal is not being pursued. This solution should still be considered if future conditions allow, but should not be depended upon. Require that buildings and their uses along Harney and Alana face those streets with appropriate entries, setbacks or other features that will enable appropriate activation of Harney and Alana as urban streets, regardless of the final configuration. Establish a mechanism that will assign responsibility in an equitable way on the implementation of streetscape and infrastructure improvements along with other possible off-site improvements. ENCOURAGE WALKING AND BICYCLING AS THE PRIMARY MEANS OF ACCESSING DAILY SERVICES AND NEEDS. The development of a streetscape master plan will enable the full realization and articulation of the circulation network. 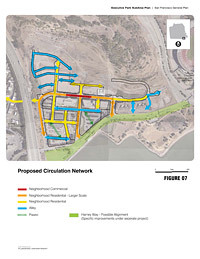 (Figure 7) The circulation network illustrates the pattern of circulation throughout the area, including bikes, pedestrians, and local vehicle traffic. The circulation network establishes safe and attractive travel routes for all modes of transportation. It calls for the addition of sidewalks on streets where currently there are none, and an eventual gracious pedestrian crossing at Harney Way to Candlestick State Park. New bike facilities should also be established throughout consistent with the City's Bike Plan and any other relevant MTA policies. Create a pedestrian network that includes streets devoted to or primarily oriented to pedestrian use. Walking should be a clear and comfortable choice. All streets should be walking streets, and the pedestrian network should include public plazas and open spaces. Land uses adjacent to the major links in the pedestrian network should be of interest to pedestrians. Conflicts between pedestrians and vehicular traffic should be minimized and street crossings should be gracious. The proposed pedestrian network should connect pedestrians to the new town center for the Subarea, to parks and open spaces, and to adjacent neighborhoods. The pedestrian network concepts are shown in the proposed Pedestrian Network and Public Open Space in Figure 9. Improve pedestrian areas by ensuring human scale and interest. In addition to landscaping, other features along streets add to the comfort and interest of pedestrians. Sidewalk paving and furnishings, if designed in a unified way, make walking more pleasurable. Gentle changes in level have the same effect. In commercial areas, continuous and well-appointed shop windows are invitations both to movement and to strolling. Transit stops should be gracious, with benches and shelters. Provide for safe and convenient bicycle use as a viable means of transportation. Bikes should be provided for throughout the plan area in a way that assures travel by bike is comfortable, safe, and accessible and is consistent with the City's Bike Plan and any other bike-related policies. The development of a Streetscape Master Plan should include provisions for bicycle travel and parking. Designations for bicycle travel should be consistent with the City's bike plan and any related MTA bicycle related policies. Provide ample, secure and conveniently located bicycle parking. REDUCE DEPENDENCY ON THE AUTOMOBILE. Executive Park local service is provided by San Francisco Municipal Railway (MUNI) bus and light rail lines. The Third Street Light Rail Line runs on Bayshore Boulevard, with stops at the CalTrain Bayshore Station, and at Sunnydale and Arleta Avenues. Executive Park is also served with an existing shuttle system, a part of the area's Transportation Management Program. A new Bus Rapid Transit (BRT) system that would run from the Balboa Bart Station to Candlestick Point and Hunters Point is now planned. The right-of-way for such transit could run along Harney in front of Executive Park along its own right-of-way. Provide a range of transportation opportunities to the residents of Executive Park. There is currently an Executive Park Transportation Management Program in place. It was created to divert office workers from their cars to transit. The Transportation Management Program should be revised to include the management of the transportation demand that would be expected from planned new residential development. It should aim to maximize the number of people who arrive at Executive Park by public transit, by the Executive Park shuttle service, and by carpools and vanpools. The program should also facilitate car sharing, and expand the existing shuttle service both in number of trips as well as number of stops. The Transportation Management Plan could also include the provision of transit passes to the area's residents. Encourage the expansion of transit services to the area. Harney Way is a main street to Executive Park, and a major access to the Bayview, Candlestick Point State Park, and other uses to the east. As new development occurs in these areas, Harney Way or alternative routes through Executive Park should accommodate the option to extend transit services and sufficient vehicle capacity to serve these areas commensurate with creating a gracious boulevard bringing the Executive Park neighborhood to the waterfront. Discourage the ownership of automobiles by unbundling parking from the provision of housing. No one should be required to rent parking they do not want nor need. The cost of parking is often aggregated in other costs, however, especially in rents for residential property. This forces people to lease parking, with no consideration of need or the availability of alternatives to driving. To avoid this, parking costs should be made visible and disaggregated from residential rents or the cost of for-sale units. The Better Streets Plan (BSP), of San Francisco, approved in December 2010, sets out new standards for streetscape improvements building on existing requirements, which are codified in Planning Code Section 138.1. The Plan was created to lay out a unified set of policies and guidelines which emphasize and improve the City's public realm. The BSP describes streets and the public realm in a systematic way that clarifies their function and how to best organize and improve the public realm. It provides standards for street typologies, lays out which improvements are appropriate for each street type, and describes specific guidelines for each element. A Streetscape Master Plan will be required prior to the first approval for development at Executive Park. Staff will review the Streetscape Master Plan against the guidelines and principles of the Better Streets Plan, and may require specific streetscape and sidewalk elements. ESTABLISH A RESIDENTIAL COMMUNITY THAT REFLECTS THE SCALE AND CHARACTER OF A TYPICAL SAN FRANCISCO URBAN NEIGHBORHOOD. Provide a consistent streetwall that defines the street as a useable, comfortable civic space. Require an engaging transition between private development and the public realm. Development must complement and enhance the neighborhood environment. In recent years, Executive Park has seen the construction of a gated residential enclave and office buildings that contribute little to the pedestrian environment, exacerbated by above ground parking and featureless walls facing the street. Applying clear development standards and design guidelines can result in buildings that contribute positively to the neighborhood and to the city. CREATE A DISTINCTIVE SKYLINE THAT COMPLIMENTS THE LARGER FORM OF BAYVIEW HILL, THE SURROUNDING NEIGHBORHOODS AND THE BAY, AND IS A GATEWAY TO SAN FRANCISCO FROM THE SOUTH. Preserve public views of the bay from the neighborhood and through the neighborhood from key distinct public locations. New buildings that extend to heights greater than 85 feet should not block significant views of public open spaces, especially large parks and the Bay. Buildings near these open spaces should permit visual access, and in some cases physical access, to them. This plan uses height limits and design guidelines to define the area's public realm and building form to preserve public views and affect the variety, activity, and liveliness of the area. Respect the form of Bayview Hill and follow the policies already established in the Urban Design Element that address building heights near the waterfront. New buildings should accentuate the topography of Bayview Hill while allowing for visual permeability to the Bay. Ensure that existing and new streets and open spaces receive adequate sunlight and sky access. Maximize sky exposure from street level and maintain an airiness to the skyline for neighborhood livability. Application of the design guidelines described in this plan will achieve this policy. Allow buildings greater than 85 feet in height only if they meet all of the criteria in the Design Guidelines. The arrangement of buildings over 85 feet can be a strong determinant of livability of the immediate area at street level. The presence of buildings over 85 feet must be tailored to support a living environment. Care must be taken to maintain sunlight to public spaces including parks and streets. PROMOTE THE SUSTAINABILITY OF RESOURCES. In the design and construction of new buildings, streets, and open space in Executive Park, use best practices for sustainable design and resource conservation. Sustainability addresses topics including energy, hazardous materials, water, human health, parks, open spaces, streetscapes, transportation and building methodologies and technologies. Promote resource conservation and rehabilitation of the built environment, using an environmentally sensitive "green building standards" approach to development. Ongoing commitment to conservation saves, recycles, rehabilitates and reuses valuable materials. The components of green building standards include resource-efficient design principles both in rehabilitation and deconstruction projects, the appropriate selection of materials, space allocation within buildings and sites for recycling, and low-waste landscaping techniques. The salvage and reuse of construction and demolition materials that are structurally sound as part of new construction and rehabilitation projects promotes the principles of green building standards and achieves sustainability. PROVIDE AND ENHANCE COMMUNITY FACILITIES TO SERVE EXISTING AND FUTURE RESIDENTS. Encourage development that provides the necessary community facilities to serve the intended population and to create a livable neighborhood. A great neighborhood has a variety of gathering places such as parks and playgrounds, a full range of public services for residents such as libraries and schools, and its own special character shaped by its physical setting, streets, buildings, open spaces, and residents. Development in Executive Park should recognize these requirements for creating a neighborhood, and they should be integral to the planning and design of individual sites within the Subarea. A key goal of this plan is to create an urban neighborhood that supports the anticipated housing development at Executive Park but also contributes to the strengthening, improvement, and enhancement the neighborhoods to the west. If the plan is realized, new residents will create significant new needs. While new development will generate real estate transfer taxes and annual property tax increases, pay citywide school fees and meet inclusionary housing requirements, additional investments in parks, streets, and community facilities and services - beyond what can be provided through property tax revenue - may be essential to meeting the needs of new residents. Active Recreational Spaces: development of neighborhood playground, pool, and outdoor education center. Library Facilities: construction of a new neighborhood library in Visitacion Valley. Community Facilities: development of community meeting spaces. Streetscape Improvements: Blanken Avenue improvements including but not limited to sidewalk widening and lighting improvements. ENHANCE PUBLIC OPEN SPACE AND CONNECTIONS TO IT. Provide convenient access to a variety of recreation opportunities. Recreation space should be provided to serve all age groups and interests. Some recreation space should be within walking distance of every dwelling. The more visible the recreation space is in each neighborhood, the more it will be appreciated and used. Recreation space should be easily accessible, and be connected by gracious streets, walkways and bicycle paths. San Francisco Bay is among the major recreation resources of the city, and visual and physical access to the Bay should be maximized. Public open spaces within the new developments should be designed with its intended use and adjacencies in mind. Its deign and construction should be done in coordination with the design and construction of the new streets. Open spaces should be part of a larger coherent network of streets, paths and larger regional open spaces including bayview Hill Park and the Candlestick Point State Recreation Area. See Pedestrian Network and Public Open Space (Figure 8). Provide adequate maintenance for public and publicly accessible areas. In view of the importance attached to the cleaning, paving and other maintenance of streets as an index of neighborhood upkeep, and as a stimulant to private improvements, these types of programs should be carried on continuously and effectively. 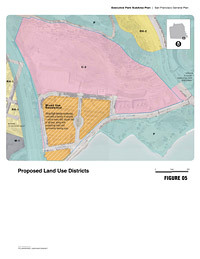 Plan adopted by Planning Commission Resolution 18352 on 5/5/2011.